The Andaman and Nicobar Islands are a collection of islands located in the Bay of Bengal; they make up a union territory of India. 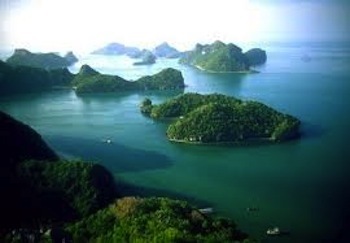 The islands are located approximately 93 miles north of the area called Aceh, in Indonesia, and are separated from the countries of Thailand and Burma by the Andaman Sea. The group of islands is broken into two distinct groups; the Andaman and the Nicobar Islands and they are split north and south by the 10° N parallel line geographically. The Andaman Sea is just east of the Bay of Bengal. The capital of this island group is the town of Port Blair, which is located in the Andamanese area. The total land area of all the islands combined is about 2,508 square miles. In 2011, the union territory’s population was 379,944 persons and only 10% of them lived in the Nicobar islands. The primary languages spoken on the islands are Bengali, Hindi, Tamil and an indigenous Nicobarese language. There are only about 450 indigenous persons living in the Andamanese area of the islands and they are of the Jarawa and Sentinelese tribes. The Nicobarese people live throughout the islands of Nicobar, while the Shompen live on part of the Great Nicobar Island. The religions most followed in the union territory are Hinduism, Christianity, Islam and Sikhism. The ancient history of the first people to inhabit these islands are unknown, but what we do know is that evidence shows the islands have been inhabited for more than 3,000 years. The earliest evidence documented by archaeologists dates more than 2,200 years, but ancient cultural studies found the indigenous Andamanese people were around during the ancient historic period called the Middle Paleolithic. The Nicobar Islands were probably inhabited by people of various backgrounds, but when Europeans arrived, the people presented themselves as Ncobarese and spoke the native language of Mon-Khmer. In the time period of 1014 and 1042 AD, a Tamil king called Rajendra Chola I ruled the Andaman and Nicobar Islands used them as a naval base to fight against the Hindu Sriwijaya Empire. The islands were also naval and maritime bases for the Maratha dynasty in the 17th century. Europeans first colonized the islands when Danish settlers of the Danish East India Company arrived in the Nicobar Islands on December 12, 1755 and on January 1, 1756, the Nicobar Islands were made a Danish colony named New Denmark and later Frederick's Islands. The islands were abandoned many times, however, due to malaria outbreaks between 1759 and 1848. Interestingly enough, one of the Dutch's temporary absences caused Austria to think the islands had been abandoned and they attempted to establish a colony on the land in 1778. Britain attempted to establish a colony during this era too, but left upon a severe malaria break-out. The Dutch really did leave the region on October, 16 1968 when it sold Nicobar to Britain; this made the islands part of British India. Britain had established control over the rest of India at this point. Britain set up a prison on the island where they sent Indian rebellion fighters that fought for India’s independence from Britain. In 1872, the Andaman and Nicobar Islands were united under the British, with its capital at Port Blair. During World War II, the Japanese took control over most of the island area, but a man named Subhash Chandra Bose visited and renamed the islands Swaraj-dweep, and Shaheed-dweep, which meant “Martyr Island and Self-Ruled Island”. India’s General Loganathan of the Indian National Army was made Governor of the islands on February 22, 1944 and India sent troops in to all corners of the island to force out and initiate surrenders from the remaining Japanese. When India had its independence in 1947, the Andaman and Nicobar Islands officially became property of India. 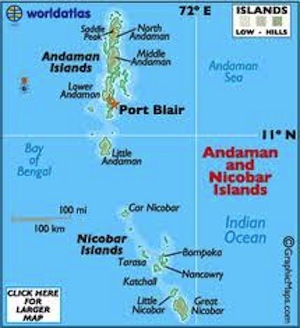 Andaman and Nicober Islands contain 572 total individual islands, with a total area of 3,185 square miles, but only 38 are regularly inhabited. The islands’ highest point is on North Andaman Island and is called Saddle Peak; it’s 2,402 feet high. The islands have a unique tropical rainforest with more than 2,200 varieties of plants thrive; hundreds of these are plants that cannot be found anywhere else in India. Forests cover more than 80% of the region’s land area. Odd animals, such as the Andaman Wild Boar, 26 species of rodents, 14 species of bats and two additional groups of wild boars, are found on the Andaman and Nicobar Islands. There are also about 270 bird species and 225 butterfly and moth species on the islands. In addition, the islands sport a handsome gallery of shelfish, such as the Murex and the Nautilus. The economy in the Andaman and Nicobar Islands territory is based mostly on agriculture. About 120,280 acres is used for farming and agriculture purposes. The biggest food items produced and sold by the territory are paddy, coconut and arecanut. Pulses, various oilseeds, mangos, sapotas, oranges, bananas, papayas, root crops and other fruits, spices and vegetables are also produced here. Hand-made crafts are produced by thousands of small businesses here and there are two main fish exporters. Several industrial items are produced here too, such as polythene bags, PVC pipes and fittings, paints and varnishes, fiber glass, flour, soft drinks and more. Overall, the gross state domestic product is estimated at more than $384,000,000. Are you thinking of traveling to Andaman and Nicobar Islands? The top tourist destinations in the Andaman and Nicobar Islands are Cellular Jail, an old British colonial prison; Baratang, which houses the only mud volcanoes in all of India, Barren Island, an island with an active volcano, which last erupted in 2005; Havelock, a gorgeous island area that happens to be known for having man-eating salt water crocodiles in its territory and Mount Harriot, known for its beauty, Andaman wild pigs, salt water crocodiles and robber crabs. 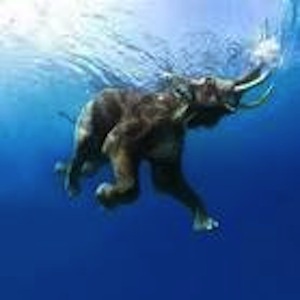 Leave Andaman and Nicobar Islands to visit India States and Union Territories. Get helpful travel advice for traveling to India.